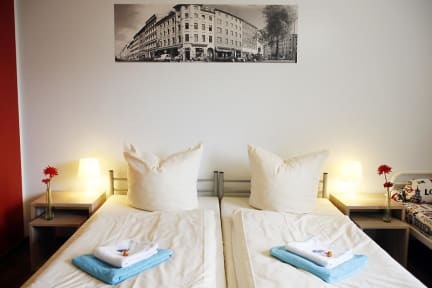 Happy Bed Hostel - Hallesches Ufer i Berlin, Tyskland: Bestill nå! You are looking for sustainable travel? Check. We are a recognized non-profit organization for youth development and support. So if you stay with us you help us to do good things and also keep your karma in balance! Do you rather spend your money while you are awake? Check. We keep the accommodation costs as low as possible. So you will be able to spend your money for events, partying and shopping. We have rooms to suit every budget, from private rooms to shared mixed dormitories. All of our rooms have ensuite bathrooms and showers. Free services: Wifi in the whole hostel, maps, guest kitchen, luggage room, parking, lockers and much more! You are looking for a secure place? Check. 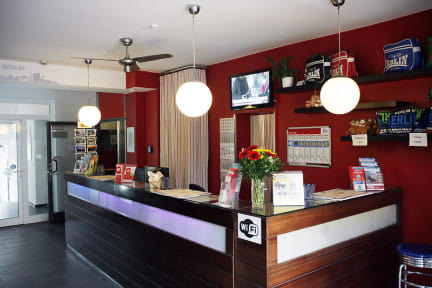 We have a 24 hours reception, with key card access to all our bedrooms, lockers in the dorms and the luggage room. Enjoy the beautiful view over Berlin on our rooftop while having your breakfast. If you’re younger than 27 years old we are happy to provide a complimentary breakfast to start your day off right. For guests older than 27 years of age, our full breakfast buffet is available for € 5,50 per day. You can bring your own bed linen or you just rent it from us for € 2.90 . Sorry, but sleeping bags are not allowed for hygienic reasons. Bed linen and towels are included in single- and twin rooms. You can rent towels at the reception. Come when ever you want, you can store you bags in the luggage room. If the rooms are ready, you can check in earlier, but we can't garuantee. Late checkout 1.00 pm - 5 € per person. I spent very little time at the hostel, and didn’t participate in any activities or anything like that, but the room was nice and clean and the staff friendly and helpful. Neither did I try the breakfast, even though it was free for youngster like myself, but I’ve heard good things about it. Didn’t pay anything for linens, but I think that might just have been because I visited out of season. All in all a pleasant stay. Considering the price and location, this is definitely a steal.